As some of you may have noticed our site has been undergoing maintenance for the past few days. As such all posts made for our 2018 events are not currently accessible so we thought we would provide a brief summary about what we have been up to! In January our space display that was created for the City of Nanaimo’s family event Space Jam New Year’s Eve Finale 2017 was moved from the Beban Park Pool lobby to the Harbourfront Library. 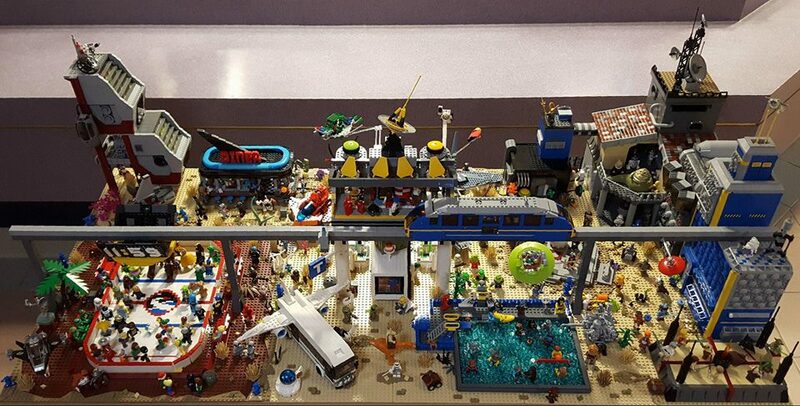 This collaborative space themed display portrayed different activities that would be included in the Space Jam Finale including a huge skating rink with the classic space logo at centre ice! MILUG returned to the Maple Sugar Festival put on by L’Association des francophones de Nanaimo in February. This celebration of French Canadian culture is always a lot of fun to attend. Our display included many of the elements of the Maple Sugar Festival – a pancake breakfast, tapping maple trees and boiling the maple over an open fire in the forest, a maple sugar shack, a lively barn dance, and even maple syrup taffy on snow – yum! In March one of our members attended Capital City Comic Con in Victoria BC as the only MILUG representative. 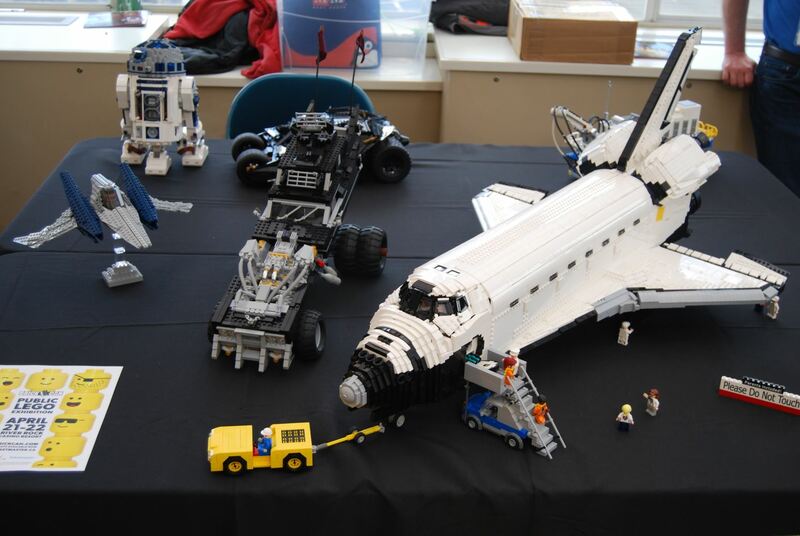 Along with his playable minifigure scale Space Shuttle there was a large MOC (my own creations) display including a Bricktoria scene, two giant mosaics built by the public throughout the event that were created by Robin Sather of Brickville DesignWorks (Canada’s only LEGO® Certified Professional), a play brick area, and build contests. 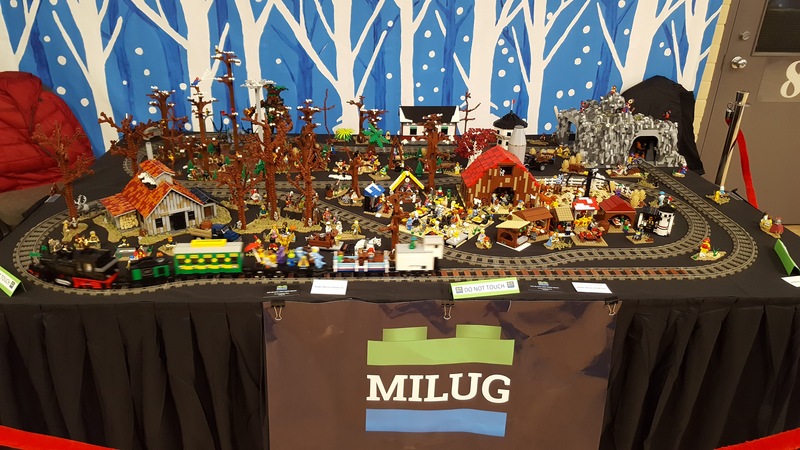 The following week saw MILUG put on a large collaborative display at GeekCon at the Nanaimo Harbourfront Library. The con featured a Minecraft tournament so we thought a Minecraft display would be a great idea and both kids and adults really seemed to enjoy it. We also tried something new and decided to build part of the display throughout the day as we interacted with the public. This was a lot of fun and we look forward to building on site again in the future. 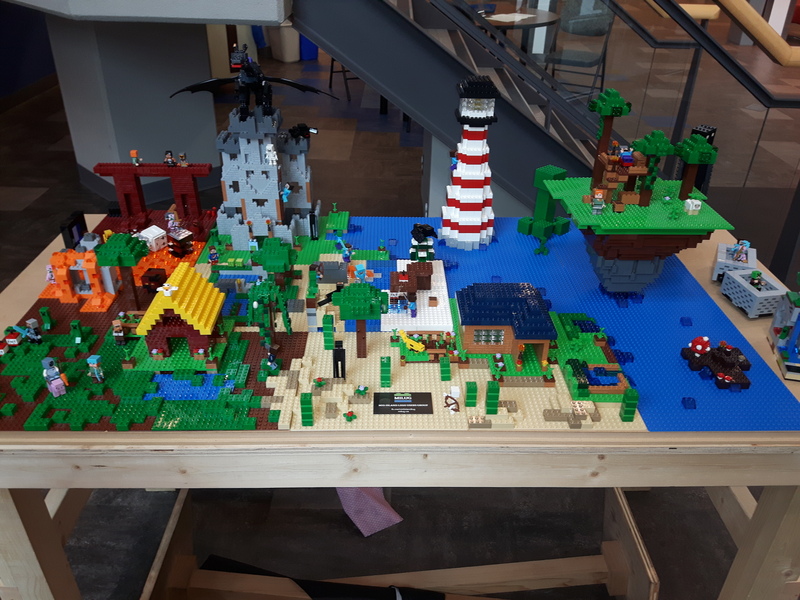 This display was then moved to the main case in the lobby of the library for a number of weeks before it was replaced by an array of MOCs created by many different MILUG members to show the variety of styles and themes that we build in. 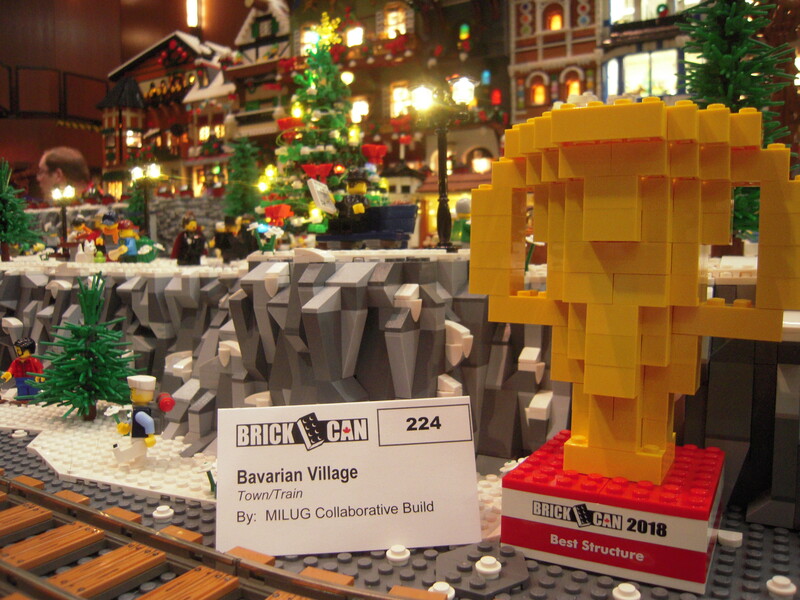 In April many MILUG members were busy building for BrickCan later that month at the River Rock Casino in Richmond, BC. Eleven MILUG members joined adult builders from around the world and participated in build challenges, activities, workshops and more. A large part of the event is the 2 day public exhibition (the largest in Western Canada!) where the public can come view all of our MOCs that we have been working on throughout the year. This was a great year for MILUG as we took home an award for Best Structure in the Architecture category for our Bavarian Village that was built by a number of our members who attended the convention. Two individual members also took home some hardware for their MOCs – The Koons award in the Art category for the Beyond the Pages bookshelf, Best Concept in the Model Teams category for a Divco custom 1950s milk wagon, and the Atomic Architect award in the Fallout Shelter category for the Supervillain Funhouse. We can’t wait to go back to BrickCan again next year! 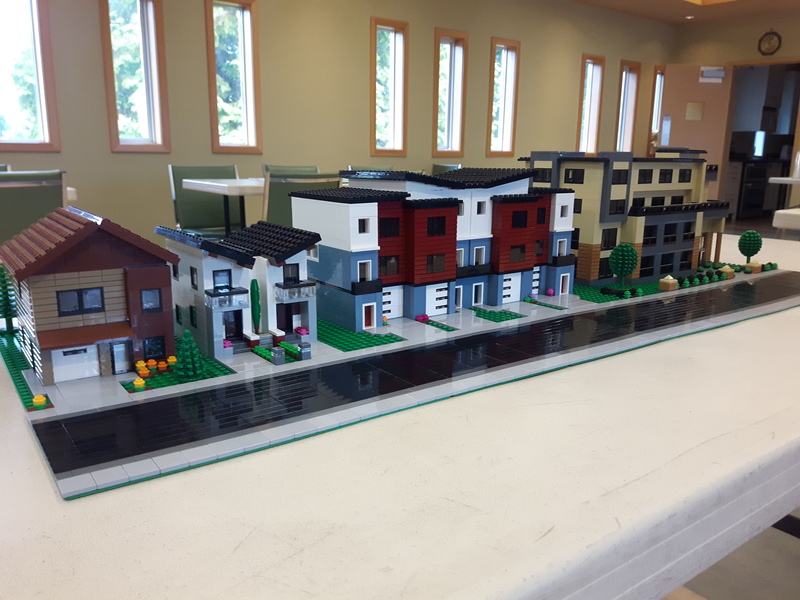 Less than a week after we got back from BrickCan a couple of MILUG members put together a display for the City of Nanaimo’s Affordable Housing Strategy Expo. This display presented a unique challenge as the scale was not one we were familiar working with. It was a lot of fun trying to find parts that could be used to represent various features at a smaller scale such as using windows as doors! We really enjoyed working with the City of Nanaimo on this project and building in a new scale. Currently MILUG members are busy building for Curious ComiCon this weekend, May 5th, at Country Club Centre in Nanaimo. This is a free family event so come on by and say hi to MILUG. We would love to meet you! If you are an adult fan of LEGO® (AFOL) you are welcome to come out to our monthly meetup on the first Wednesday every month at White Sails Brewing. Meetings are casual and fun. Feel free to bring a MOC you are working on or just come and hang out with other adult LEGO® enthusiasts! Check out our Facebook page for details.